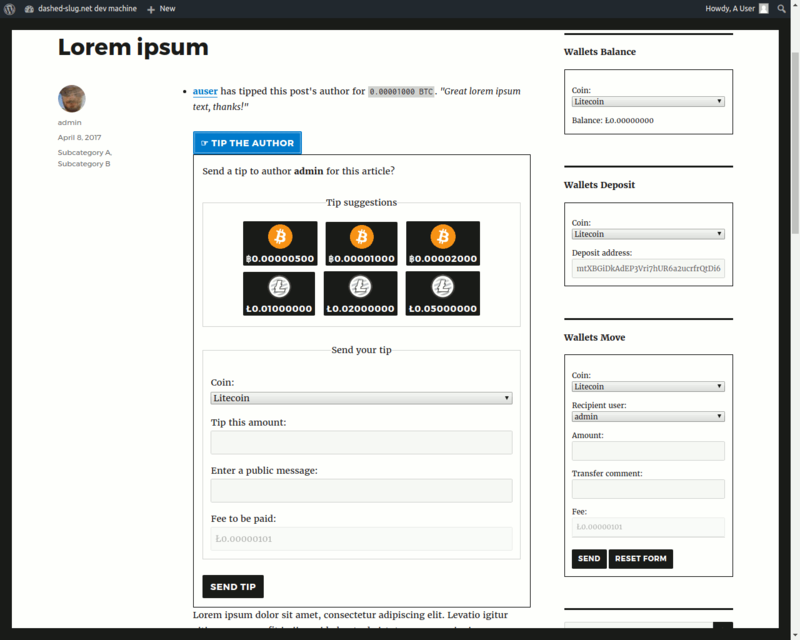 With this extension, users of the Bitcoin and Altcoin Wallets WordPress plugin will be able to tip the author of a post using cryptocurrencies that they have on your site. The list of tips paid to a post shows near the top or bottom of the post, along with a form that lets the reader send a tip to the author. All authors who have the has_wallets capability will be able to receive tips. An administrator with manage_wallets can choose which categories or types of posts this applies to. 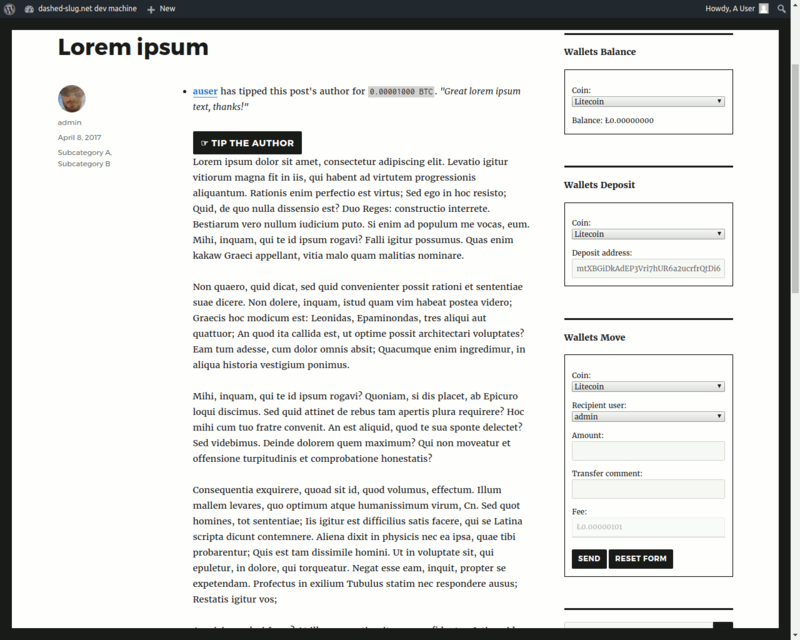 The UI can be shown at the header or footer of a post. Suggested tip amounts in various currencies can be configured. The Tip the Author extension settings page, allowing you to filter posts by post type and category. List of tips and tipping button at header of article. When a user clicks on the Tip the Author button, the tipping form expands, featuring suggested tip amounts. Check the tip settings in the admin menu. 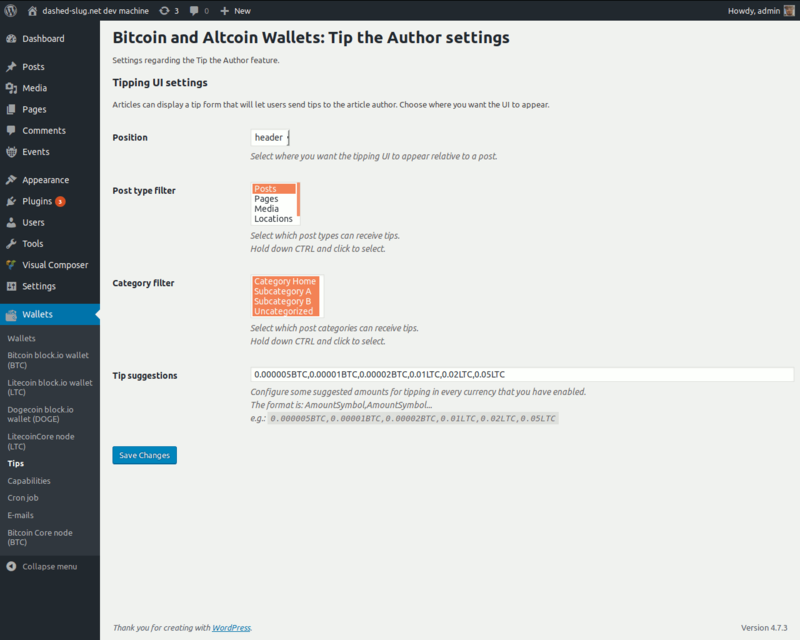 A user with the manage_wallets capability must enable tip_the_author and has_wallets for user roles who will be able to send tips. The user role of the author of the post must have the has_wallets capability. Go to Wallets → Capabilities and set it. Check that there is at least one coin adapter enabled and responding. Go to Wallets to check. You are not supposed to see the tipping UI when you view your own articles. You should however be able to see the list of tips that others have sent to your article. Updated on 2018-10-30T17:43:55+00:00, by alexg.